Say.com goes live to help small shareholders have a greater voice in how the companies they’re invested in are run. Say facilitates proxy voting for shareholders who invest at the broker-dealers it is partnered with and also is creating new products for all shareholders to engage with companies, regardless of where they invest. 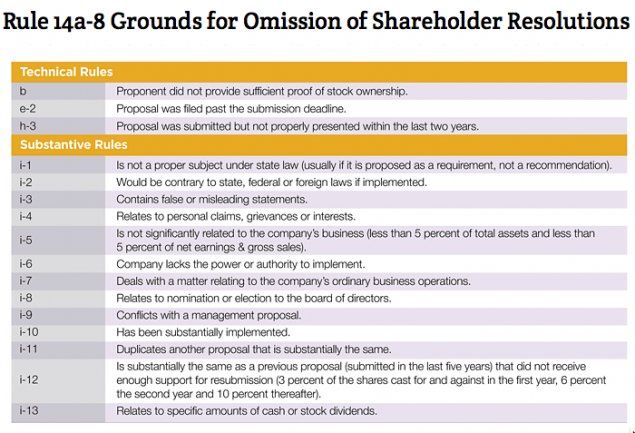 Unlike Rule 14a-8 shareholder proposals, Say.com is not bound by restrictions as to what questions shareholders can pose to companies, such as those outlined in the graphic below. Where will the Tesla Semi & Model Y be produced? Can you share a timeline on the expected production ramp of these vehicles? Owners, many of them with large followings online, are becoming very vocal about Tesla’s worsening customer service experience with delivery, service, and repair. This has a severe impact on sales and returning sales. What are you doing to change this growing negative reputation? Tesla has a classified board and does not allow shareholders to call special meetings. A 67% supermajority of shares outstanding is needed to change bylaws. Will Tesla become more democratic by allowing a simple majority of shares cast to prevail on proxy issues? My question is way behind in the voting, but I understand most people are not so interested in the rules of corporate governance and who has power in our company. As I have argued in recent posts, concentration of equities under the umbrella of 3-4 large, mostly indexed, funds presents an ironic opportunity to push companies toward accountability. The Berle and Means separation of ownership from control is disappearing. Accomplishing the goal of better accountability depends largely on mechanisms that drive public and shareholder opinion. Sites like Say will eventually help retail shareholders be aware enough of the issues to vote their proxies. As reported by Global Proxy Watch, critics laid out their complaints in a letter sent to Fink before his even went out. They argued he should tell boards in carbon intensive sectors to adopt strategies for meeting the Paris climate agreement. Boston Common Asset Management, Swiss fund group Ethos and ten other groups, urge BlackRock to vote for proposals calling for such actions. BlackRock’s 2017 votes for climate risk policies at ExxonMobil and Occidental were a good start but are not enough. They voted, and continue to vote, against such proposals at most companies. Say.com users will start demanding real-time disclosure of proxy votes of their 401(k) holdings, just as Say.com now provides real-time updates of opinion voting. We do not want to wait until August 2019 to see how BlackRock voted in September 2018. Go ahead. 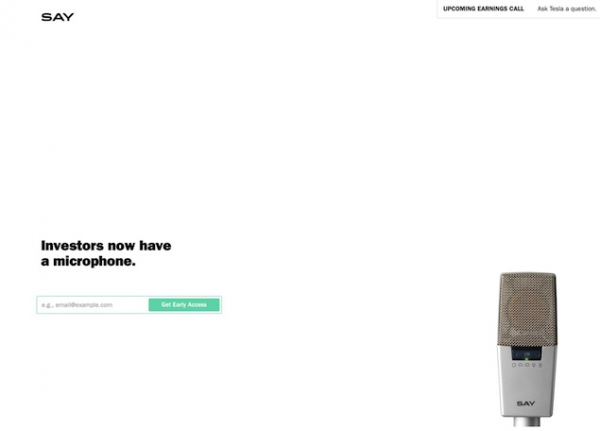 As Say.com goes live, I want readers to participate. Starting the dialogue is far more important than any initial outcomes. Take Say.com for a test ride with Tesla.